In order to ensure that your trees are healthy and beautiful it is very essential that you take proper care of them. Sometimes the help of a professional tree doctor or tree health care companies can be required if your trees are facing any sort of problems related to their health. A person who studies the cultivation, management, and individual trees, shrubs, vines and other perennial woody plants is known as an arborist. There are many companies which are providing professional tree health care services. One of the most renowned companies in this field is Arbor Care, Inc. They strive at providing quality tree care and are one of the most professional, honest and dependable tree care company in the area. Through continuing education and staying current in the latest trends and best practices in tree care, their goal is to provide their customers with high quality tree care services with proven results. The tree services that they provide include arboricultural consulting, tree transplanting, big tree moving, tree sales, GPS tree inventory and GIS mapping, plant health care, insect and disease control, large area rough moving and custom tree digging. This company is located on 22264 Pfeiffer Rd Frankfort, IL 60423. The landscaping done around your house can make a lot of difference. It can convert a normal looking house into a one that can be seen on the front cover of a luxury real estate magazine. But for this purpose it is very essential that you hire professionals like Arbor Care, Inc. which can provide you with the best possible services. Through carefully executed tree transplanting techniques, you can have beautiful, fully grown trees of any size right on your very own property and make your house look more appealing and beautiful. They help in both purchasing as well as relocating existing trees. It is very important to inform you that the overall health and appearance of trees is greatly affected by the individual who is performing the tree service. So in order to get the best results, it is very important that the services of a professional tree mover are hired. If a tree is planted properly and with great care, it can lead a healthy and strong life for years to come. However, of you hire an unprofessional; he can damage the trees which will eventually shorten its life. Apart from a damaged tree you also would have to suffer a financial loss as you would have spent a lot of time and money investing in raising a tree to its full maturity. When you choose a professional tree transplanting and relocation service like Arbor Care Inc., you can have a peace of mind that they will perform your tree work properly and safely. 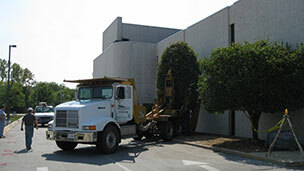 They provide tree transplanting services throughout the year. Certain trees can only be dug in season in order to survive the transplanting process, so it all depends on the species that you want. So beautify your property by hiring professional tree movers like the Arbor Care, Inc.